In 2009, Gretchen Schock started Bee Yoga Fusion as a mobile yoga studio based out of Greenbelt, Maryland. Gretchen would show up at any venue to teach yoga, from lunchtime corporate clients to homeschooled children, and she hosted a donation only community class in the basement of a local church. Fast-forward to 2016, Gretchen opened the doors to the boutique yoga studio at 111 Centerway (2nd floor) in Roosevelt Center with the same name- Bee Yoga Fusion. Gretchen takes great pride in offering a place where all people feel welcome regardless of size, shape or experience. She has been intentional about growing the studio slowly so that she could bring quality instructors and an assorted offering of classes while keeping the customer service a very high priority. 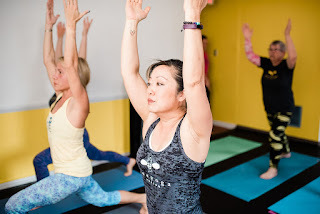 The intimate setting of the studio combined with the instructor's personalized approach to teaching classes makes Bee Yoga Fusion a joy to be a part of. The community at Bee Yoga Fusion is a place where you will comfortable and connected to others. All of the classes offered are both fun and challenging.